Most of us have had a beer so good that drinking it was “like a religious experience.” But when was the last time you were served a bowl of murky grog at church? Early people from Mesopotamia to Mesoamerica celebrated everything with beer—from their daily prayers and good harvests to human sacrifice and their gods. Who could have made this stuff up, you’re wondering? Well, the gods did. Often the recipes for these beverages were transmitted through visions of tribal deities. They required specific ingredients and equipment bestowed with magical properties. Mythology and sacred poems accompanied the brew. Righteous consumption demanded special drinking vessels and adherence to ceremonial customs. “In a world so lacking in modern comforts like ibuprofen and dental care,” reckons Santa Fe brewer Cullen Dwyer, “a food that required no chewing and let you forget your aches, pains and cares must have won a big double thumbs-up.” It’s true. Beer was medicine. And it was also a staple food, a religious sacrament, social lubricant and aphrodisiac. Just about every ancient culture had a tradition of altering consciousness through drink or narcotic substances. Around 10 to 12,000 years ago, at the start of what archaeologists call the Neolithic period, bands of hunter-gatherers began settling down to grow crops, domesticate animals and get down with their party selves. These societies did not explain their universe with science or with belief in a single god—their world was defined by a pantheon of gods and goddesses, animal spirits and ill-minded demons. Beliefs were steeped in the mysterious and were often closely tied to the plants and animals of their sphere. Dr. Patrick McGovern of the University of Pennsylvania Museum points out, “The mind-altering effects of a fermented beverage, as well as the mysterious process of fermentation, probably account for why fermented beverages came to dominate entire economies, religions and societies over time.” Indeed, to drink the tribal brew was to be one step closer to the spiritual world. Take the Vikings. In their mythology, warriors who died in battle passed on to Valhalla. Once there, you’d find yourself in a gigantic gilded beer hall where endless mead was produced by Odin’s magical ewe Heiðrún. But just so fierce warriors wouldn’t get soft from all the boozing, you would battle with each other all day, drink all night and in the morning wake up feeling better and do it all over again. In Valhalla you had ultimate fighting in an ultimate man cave. Vikings did not live on just mead and ale. We know they preserved fish and meat, and they ate cheese and eggs of all sorts, which meant they kept animals. Making sheep’s cheese was a prized means of preserving milk for the rest of the year. Whey, the lactose-rich, greenish water leftover from making cheese, is most often fed to farm animals. The ingenious Norse put it to a different use, however; fermenting it into a drink called blaand. How can we be sure that what flowed from the great Heiðrún’s hydrant wasn’t really blaand? As anyone who has ever made a cream stout knows, beer yeast does not digest lactose. That’s why a cream stout is sweet and full-bodied. But have you ever heard of a cream lambic? No. And you won’t anytime soon. It is with the help of the wild yeast Kluyveromyces and lactic acid bacteria similar to those in a Belgian sour that lactose can be broken down for fermentation. Blaand was kept in barrels where one could draw off a portion of the sour elixir, then replace the void with more whey and possibly extra sweetener when it became available. Think of it like sourdough bread with benefits. Copping a buzz was an essential ritual for the Vikings. Their very version of heaven was swimming in alcohol. So were they really restless and violent? Or did their love of drink drive them from rocky headlands in search of barley fields, beehives and greener pastures for their herds? How can we know what was in these ancient drinks? One way is to study archaeological sites looking for brewery-like structures and equipment. Often times murals, ancient writings or drinking vessels have been found. As added credibility, sometimes the modern culture that descended from the ancients still brews the same type of beverage. The sciences behind archaeology have gotten increasingly sophisticated, too. Biomolecular archaeologists are using DNA sequencing and high-tech chemical analysis of pottery remains. Ethnobotanists deduce what people ate and drank from ancient plant residues. Theologians and historians translate sacred texts. And this leads us to the question; How long have humans have been fermenting? Alcohol-producing organisms likely existed on Earth 4 billion years ago. Consider that animals from birds to bears to elephants know how to source alcohol. “Even deer know about [hard] cider” from rotting apples, say cider maker Ria Windcaller. Much research has gone into the earliest known barley beers, which seem to have originated around present-day Egypt, Iran and Iraq. The “Hymn to Ninkasi” dates from 1,800 B.C. It praises the goddess of beer, and in a roundabout way describes part of the brewing process for Sumerian kaš. Hard barley bread (“bappir”) was softened and fermented. The no-doubt lumpy brew was consumed from urns through straws. Chemical evidence dating to 3,000 B.C. indicates even earlier brewing. Anchor Brewing and Scottish & Newcastle even made one-off commercial versions of the drink. 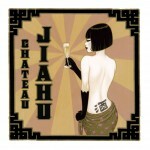 This summer Dogfish will release their interpretation of a similar brew dubbed Ta Henket. It is fermented with wild yeast captured in an Egyptian date grove, but will still likely be on the tame side, as all modern renditions seem to be. If you want to experience the true gritty nature of primitive ale, the people of Tibet presently make a grain beer that is consumed, like kaš, through a perforated straw. In the thin air and isolation of the Tibetan Plateau ancient practices have survived—including the production of chhaang. In wintertime, Chhaang is consumed hot through a straw called a pipsing. When Buddhism arrived in the seventh century, western Tibet was occupied by descendants of the Zhang Zhung civilization. These people practiced a shamanistic religion called Bön. Shaman initiates lived in the wilderness and communed with spirits until achieving “divine madness.” The principal peaceful deity of Bönism is the mother goddess called, believe it or not, Yum. When your goddess is named Yum, and you’re looking for divine madness, might there be beer involved? But Buddhism shuns alcohol, doesn’t it? In a word, sort of. Tibetan Buddhism relies on looking inward into the mind-body, anything that alters the mind-body in a negative way would be discouraged. 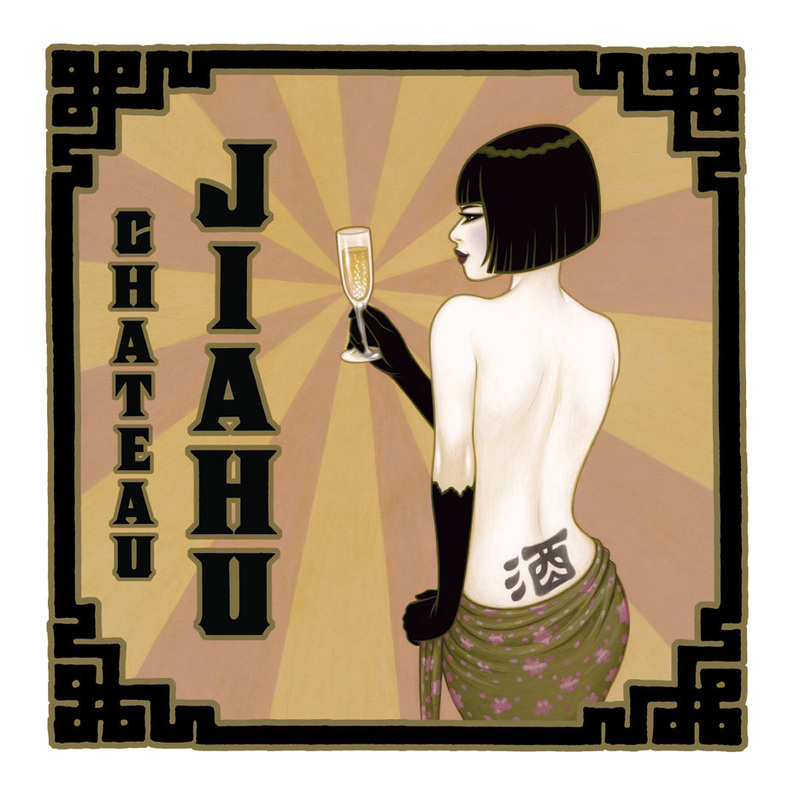 But there are some teachings, like the Vajrayana tradition of Tibet, that allow “mindful drinking.” This is where one drinks a little, assesses how they feel, then decides whether or not to have a little more. Despite the extraordinary altitude of the Tibetan Plateau, a form of highland barley called qingke proliferates. Millet and rice are also common in chhaang. The brew is consumed both casually and ceremonially, such as when hosting visitors to one’s home, or for the Tibetan New Year celebration of Losar, which has its roots in the earlier Bön traditions. Here’s how chhaang is made. Grains are boiled in water until soft. They are laid out on a mat to cool. By some accounts, the brewer then disrobes and rolls over the grains to mash them somewhat. That’s right, you get naked, roll on the barley, and then add crumbled dry saké yeast that may also contain koji culture (Aspergillus oryzae). Talk about house character! After this the grains are hung in cloth until they develop a “godly smell.” If this is godly, god must need a shower. Once ripened, the grain mass is put into an airtight container for a month, so the whole mash ferments. When you want some chhaang, you load a wooden tankard with the fermenting grains, pour hot water over the top and drink the resulting liquid through a perforated straw. Don’t worry about that stuff on top that looks like algae. Best advice for drinking chhaang: Try not to picture your host without clothes. A little farther north are the Mongolian steppes—a harsh climate that isn’t good for growing barley. The nomadic people here herd yaks, sheep and horses. Yak butter is a staple and is stirred into milky tea. But an even tastier drink is airag, a cloudy, sour beer made with mare’s milk. You got that right, horse’s milk. 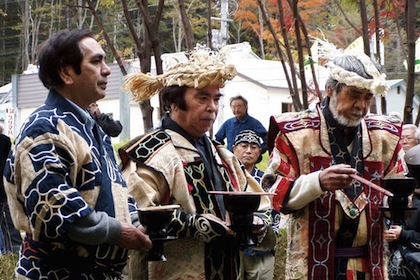 Not too far to the east, the aboriginal Ainu people of Hokkaido, Japan, still practice an animist religion in which offerings of rice or millet beer are made from a special bowl called a tuki. A carved prayer stick, the ikupasuy, (literally “moustache lifter”) is used to shake drops of the beer onto the ground in four directions. Just like most other cultures making ceremonial brews, after expressing humility and reverence, those offering the prayers get to drink up what’s in the cup. 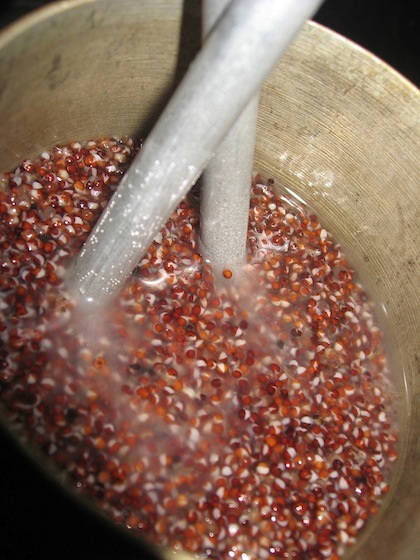 Ainu elders dip ikupasuy (“prayer sticks”) into sake or millet beer, and the sprinkle drops of the liquor. When the Chinese invaded Japan long ago, they brought with them rice-farming methods. Naturally this lead to the making of saké. When Buddhism arrived several hundred years later, the best of the earlier Shinto beliefs were rolled in. One of these was the annual harvest festival called Niiname-sai. Saké is essential to Niiname-sai and it is a common offering at temples even today. There seems little doubt that early Asian or Siberian people migrated to the Americas over the Bering land bridge. Genetics are backing this up, but if you consider the ceremonial use of alcoholic drinks between both continents, the similarities are striking. But if the First Americans brought fermentation with them, that would place early beer making somewhere around 120 centuries ago—a few thousand years earlier than any current archaeological evidence of brewing. And if they didn’t bring homebrewing with them, it is something of a coincidence that the first fermented drinks might have been made in Africa, Mesopotamia, Turkey, Western Asia and the Americas all more or less around the same time. Some history buffs have speculated there was no existing brewing culture in North America prior to arrival of the Europeans. True, nobody we know of was malting barley and adding hops in big copper kettle. But the people who were already here knew how to brew with just about anything they could find and they had been doing so for centuries. The Tohono O’Odham tribe of present-day southern Arizona have a long tradition of making a ceremonial drink from the fruit of the revered saguaro cactus. Legend says that I’itoi, the creator of the people, taught them to ferment. The drink was used on only one occasion per year to both bring rain and to encourage fertility for the people and their crops. The nawait was fermented in clay pots or tightly woven baskets that were set into the ground in a special hut. Elders kept a vigil by maintaining a small fire and singing special songs. When it was ready, messengers called everyone to the ceremony. “The cider keeps its intoxicating quality for a few hours only,” wrote Underhill, “and while it is in this state, every drop must be consumed.” So after no rain for months and with food supplies running low, the community came together, danced, sang and “floated the keg,” as we say. If they kept their hearts true, sang well and drank every drop, the life-giving summer monsoons would shortly appear. 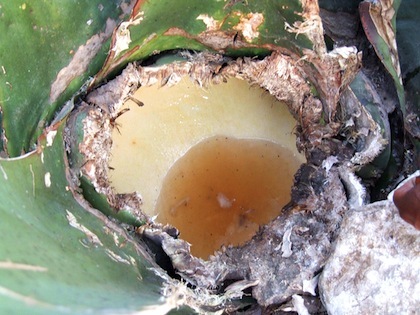 Aguameil, literally 'honey water,' collects in a well created in the center of the plant. Further south into Mexico, the Aztecs made ceremonial drinks such as pulque from the fermented sap of the maguey plant, and xocolatl, a cocoa beer made from the fleshy pods of the cacao tree. Xocolatl gives us the word chocolate, but only centuries later were the fermented seeds of the fruit used, as in modern-day chocolate. Pulque, on the other hand, has changed little since the goddess Mayahuel and god Tepoztecatl taught the ancients its secrets. 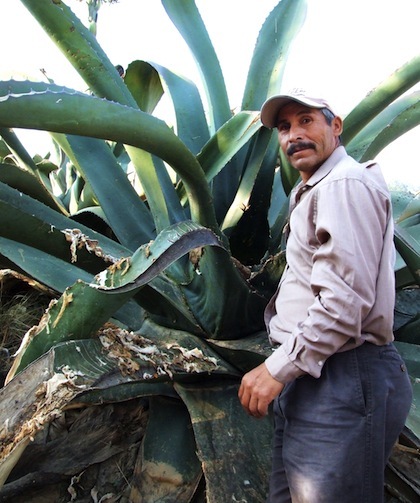 The maguey, a giant octopus of a plant, is differentiated from other agaves because its swooping arms “point to heaven.” The tlachiquero retrieves the sweet sap from a well made in the center of a mature maguey. It immediately begins fermenting due wild bacteria called Zymomonas mobilis. 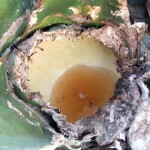 A tlachiquero gets ready to collect sap from the maguey. “Zymomonas is a broad range of bacteria,” says director of White Labs, Dr. Chris White. “It is unusual for a bacteria to produce alcohol and this one can tolerate alcohol to 10 percent, but it also makes green apple and lactic acid flavors.” White says Zymomonas is considered a contaminant in a modern brewery. But the Aztecs didn’t mind the sour vegetative taste and mucilaginous texture. Priests consumed pulque during important celebrations and sacrifices. The drink would instill a feeling of well-being and would even be fed to those virgins or prisoners of war about to be sacrificed. By some accounts, the sacrificed prisoners were then cannibalized—hopefully consumed with more pulque, because you’ve got to wash that down with something. Chicha was, and is, another indigenous brew made by the Aztecs and Maya, as well as throughout North and South America. Typically a rustic brew of maize kernels, it can be made from corn stalks, manioc roots, plantains, amaranth, you name it. All of these starchy foodstuffs require some enzymatic degradation into fermentable sugars. Therein lies the rub, or the cud, so to speak. When brewing with the tough roots of manioc, brewers thinly slice or pound the roots into a fibrous mass which is then chewed and spit back into a pot. The enzymes in the saliva break down the starches for wild yeast. What results is a murky gruel nearly the strength of modern beer. With maize it is more common to chew a mouthful of flour or grits until it forms a gluey ball. The balls of dough are then dried overnight or slowly baked, then boiled in water the next day to make chicha. Any variety of maize might be used, and together with herbs, nuts, or fruit, no two chichas will be exactly alike. Dogfish’s latest version of chicha incorporated purple corn and herbs from Peru, but malted barley was also added. This seems a common practice for those brewing commercial interpretations of ancient brews, from Anchor’s Ninkasi to Nønge Ø’s Sahti to Wynkoop’s Tut’s Royal Gold. Malt is added to provide a safety net, guaranteeing adequate enzymes for the mash. It also helps boost strength and add the familiar flavor of beer. Dogfish’s Sam Calagione says malt is used for all of these reasons, as well as to conform to the modern, legal definition of beer. But Shelton thinks modern brews miss the point. “Putting spices into sweet, strong beers fermented with a standard, clean, cultured beer yeast will provide no clues about how those ancient beers might have tasted.” Instead, he points to two other trends in beer fashion: lower alcohol beers and sour beers. It is a fusion of these two classes that defines ancient brews, which are essentially wild, sour, session beers. As for his modern chicha, Calagione wouldn’t admit it tasted like the Peruvian ones, but he would say, “We liked it.” One customer reportedly enthused “Huh? Spit happens. I’ll take a bite.” While another wrote on brewer Bryan Selder’s blog “I am so traumatized by the whole spitting and drinking it that I am not sure I can ever drink another beer of any kind ever again.” Verily, ancient beers may not be for everyone. In a world of precision ingredients and computer-controlled breweries it is easy to lose sight of something the ancients knew long, long before us: A little beer not only helps to liven the party, it brings magic into our daily lives and it helps us feel closer to the divine. And who knows, drinking a primitive brew may even improve your next ritual sacrifice, er, that is, barbecue. Matt Stinchfield is a writer, brewer, professional beer judge and amateur cheese maker. When he isn’t chugging pulque, he assists breweries with safety compliance. See what he’s up to at palatejack.wordpress.com.